Rock Against Iron: Marciano vs. Tyson! Marciano versus Tyson. Who Would Win? 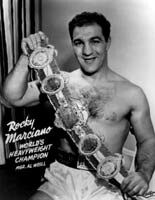 Rocky Marciano, the “Brockton Blockbuster”, reined as heavyweight champion from 1952-1956 retiring with an impressive record of 49-0. He is the only unbeaten, untied champion in boxing history. He made 6 successful defenses of the heavyweight title before retiring as champion. “Iron” Mike Tyson was the youngest heavyweight champion in history at age 20. He cut a swath through the heavyweight division from 1986 to 1990 and was one of the most feared heavyweight champions ever. He made 9 successful title defenses before losing in an upset to Buster Douglas. He continued his career with limited success thereafter, although he was never quite the same after his loss to Douglas and a prison incarceration in the early-mid 1990's. Tyson's 23 first round knockouts are third in division history to Jack Dempsey (25) and Earnie Shavers (24). This is a match up between two of the heavyweight divisions greatest knockout punchers. Who would win if Rocky Marciano met Mike Tyson in their considered primes? The first thing one notices when looking at the tale of the tape in a match up of Rock versus Iron is the size difference. While they are about the same height Tyson clearly has an overall advantage in size. He is bigger and stronger on paper. While size is not the most important issue, Tyson, weighing in at 216 (his weight for the Spinks fight) would have a 31-pound weight and strength advantage over Marciano. Some argue that the former cruiserweight Evander Holyfield beat Tyson and therefore so could Marciano. However, Holyfield had a tall frame and was able to add more muscular strength. When Evander fought Tyson he weighed 215 pounds and was in great physical shape at that weight. Marciano, like Holyfield, was a conditioning horse but he fought at his best weight which was around 185 pounds. Evander Holyfield scored a victory over Tyson in one of Mike's legacy fights, a loss for Tyson. But in a comparison, Holyfield and Marciano have almost nothing in common except conditioning, and physical and mental toughness. This is an important ingredient one must have in order to be able to turn the fight on Tyson if one can survive the initial onslaught. In terms of style however, one can easily see that Marciano did not fight at all like Holyfield. Evander was primarily a boxer and a counter-puncher with a good jab. Marciano was a crouching slugger who came in low and threw a lot of punches, often wildly until his opponent's wilted. The only thing Marciano and Holyfield have in common is a strong chin and a will to win that is greater than that of Tyson. Marciano had much better stamina and better one punch hitting power than Holyfield, but Rocky did not possess Holyfield's speed, punching accuracy, quick multi-punch combinations or countering ability. Mike Tyson is very similar to Jack Dempsey in his style of fighting. He was a bob and weaver, he threw his right to the body just like Dempsey, he was explosive in the early rounds, and had the same type of killer instinct. Dempsey was more durable and fought better when hurt. I am reminded of the following story from the from the Dec 1988 Ring Magazine, "Tyson and Dempsey: Is History Repeating Itself?" Writer John Reeves wrote about an incident in a bar while viewing the Tyson-Pinklon Thomas fight. Reeves had said to an old pug watching the fight, "A lot like Marciano huh?" "Not really" the old man replied, "I wouldn't say so. He fights more like Dempsey." He stared at the young fan for a moment then turned his attention back to the screen. "But a guy your age wouldn't know too much about Dempsey", he said. There was almost a hint of sympathy in his retort." There are a lot of similarities between Tyson and Dempsey. Reeves noted, "Like Tyson, Dempsey fought out of a crouch, constantly moving in a bobbing and weaving fashion so taller men would be forced to punch down at a mobile target. Both learned to pressure their way inside and unleash furious volleys of head and body punches. Both ended a lot of fights early with devastating power." Looking at Marciano and Tyson one sees that both are aggressive swarming style fighters. Marciano threw alot of punches, but was wild and lacked punching acuracy. He was an "anywhere hitter," he didn't aim his punches, but anywhere he hit it hurt. Tyson was a two-fisted dynamo with fantastic hand speed, punching accuracy, great combination and counter-punching ability. They would meet at ring center and there would be few backward steps. The fireworks would start immediately. Consider the opinion of veteran boxing writer and analyst Dan Daniel from the May 1956 Ring Magazine concerning a potential Marciano-Dempsey fight, "Dempsey would have stopped Rocky because Marciano would have taken too long to hurt the Mauler. Rocco usually warms up to his task slowly, and usually doesn't get to that point until about the eighth round. Once he has worn down his man, Rocky hurts plenty. Dempsey was no feeler-outer. The bell rang, and he went right to work, no dilly-dallying. He gave everything he had all the way." Marciano was much like Joe Frazier in this regard, although he was capable of scoring the occasional early rounds knockout most of his fights against quality opposition, like those against Don Cockell and Archie Moore, were fights where he took a few rounds to warm up. Dempsey tried to rip your head off in the opening session. Tyson was the same way. Tyson's speed allows him to get there first. Razor Ruddock after his fight with Tyson said, "I was suprised by his speed." Virtually everyone Tyson fought said they were amazed by his hand speed, and of course his power is among the best of all heavyweights of history. Marciano is a great fighter, more determined and tougher than Mike Tyson, but Tyson is a bad match up for him stylistically. Tyson can be beaten if his will is tested, but all things considered, Tyson's speed, quick start, superior hand speed, great power and punching accuracy will be too much for Rocky to survive the early rounds attack of Tyson. Rocky’s slower start and vulnerability against sharp punchers like Walcott and Moore, neither of whom had anything close to Tyson's power at heavyweight proves his vulnerability in the early rounds. This hypothesis is confirmed by watching the films. Recently I viewed some films of Marciano and Tyson on the same evening. One cannot help but notice how wild Marciano can be with his punches. He comes in low and covers up in his crouch but he is off balance and exposed when he misses, which is often. The young Tyson on film looks so much better. He slips, and counters, dodges and counters, dips and counters and moves his head very quickly. He comes in tight and throws nice short punches. It is just this type of fighter who would really make Marciano pay for his amateurish mistakes. Get wild against Tyson and one winds up looking at the ceiling. Marciano has to survive Tyson's big counters. If Rocky can make it past the first few rounds he will win. But can he? Marciano never faced a strong heavyweight puncher who weighed over 200 pounds except a faded, old Joe Louis in his last fight. The two strongest and sharpest hitters that Marciano faced Jersy Joe Walcott and light-heavyweight champion Archie Moore both put Rocky on the deck. Walcott and Moore weighed well under 200 pounds. Tyson, bigger, faster, stronger, and with more explosive accurate punches busts up the rock like an iron hammer smashing up gravel. Tyson's quick start ends things before Marciano has a chance to warm up and test Tyson's will. Iron Mike over Rocky by early rounds knockout.